Oscar of Karnia and Ruthenia was born on 14 August 1991, in Notrê-Dâme Hospital, in São Paulo, Brazil. He is the only child of the Archduke Ari, at that time a descendant of Crusader nobility and Archduchess Denise, member of an old aristocratic Hungarian family. His father was son of Archduke Francis and Archduchess Judith. During his adolescence, he used his maternal family’s title and style of “His Grace, the Count von Goëtzën“, arguing that he is the oldest and last surviving member of the family of his mother and therefore the only possible heir to the title. He was baptised at St. Stephen of Hungary’s Church on 1996. His godparents were Prince Alexander Fejes and Princess Rosalia Fejes. He attend Mário de Andrade High School and the Law University, graduating in 2013. He used to be described as someone interested in History and someone who likes the exercise of leadership. His maternal family was composed by European immigrants, who raised him linked to European reality, especially the Hungarian culture. He is able to speak Portuguese, English and understand French, Spanish and German. He join his first micronation in 2009 and learned how works the political simulation within a micronation. After a hiatus, he returned to another micronation, but faced problems with the aristocracy as minister; he would report later he felt that “the law did not apply to the King’s friends, especially if it was a noble“. At that time, Oscar would envision a micronational project, which would later be the Kingdom of Ruthenia. He and his father possesses some properties in northeast of Brazil and enjoying the opportunity, he estabilish the Kingdom of Ruthenia. In the following days, he took his new royal title, he created ministeries, government agencies, a flag, a coat of arms, the General Assembly and estabilish friendly relationship with several micronations around the world. 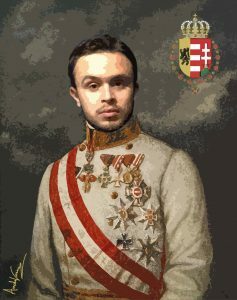 The first months of his reign were turbulent, but after the promulgation of a constitution, Oscar began to enjoy a certain prestige and is widely decorated by various micronations and succeeding in being recognized by important micronations. After an approximation and the following Karno-Ruthenian Compromise of 2016, the King of Ruthenia became also the Emperor of Karnia, a moment that marks the apogee of prestige of the Sovereign of Karnia-Ruthenia. After the stabilization of his reign as Emperor in a process that went through the annexation of Argadia, Appinfeldt and Tsechia, after the Antonian Revolution and other internal and external destabilization attempts such as the Lundener Civil War and the 2017 Karno-Ruthenian coup d’état attempt, his rule was quite peaceful and proved to be of great prestige, participating on behalf of the Empire of the Congress of Colo, the Micronational Republican Forum and other events, but also with expressive achievements, such as the Reconquest of Carpathia and the strengthening of democratic institutions – especially the Constitutional Commission and its new constitution, which he favored. 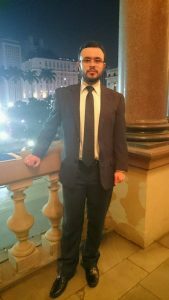 He strongly favored foreign policy, being one of the outstanding figures of the 2018 Micronational Summit of São Paulo, participating of the two editions of the Micronational Republican Forum, favored the participation of the Empire in sports championships like the Lusophone Micronations World Cup and maintained the initiative of approaching promising micronations, especially in America and obtaining great successes.